The folks over at indev just released MailTags Leopard Beta 3. There are many bug squashes and improvements. Best of all is the addition of "MailTags Extras". "MailTags now uses a modular architecture to use “MailTags Extras” that add functionality to the core tagging system of MailTags. 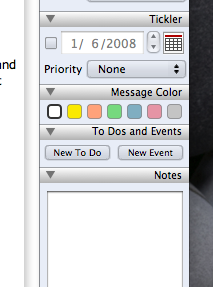 An Extra can can be as simple as the included Message Color Extra, which provide a quick pick color list for messages; or as complex as the included ICal Events and To Dos Extra which interacts with Leopard’s new CalendarStore to provide an alternative task and event system to Mail. In the future extras may be built to work with other data fields, such as a codified GTD system, or using Security Tags, and to work with other task and calendar systems, such as backpack or Google Calendar. Indev will publish a developer’s guide when the the Extra architecture is finalized." You can read about the details and download it right here. 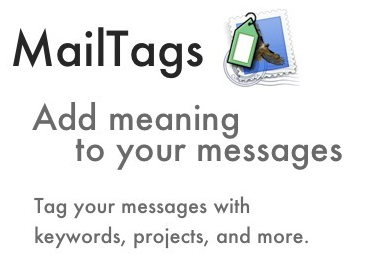 You can read my review of MailTags right here.